A full colour map of the Stourport and Droitwich Rings suitable for both waterways and leisure users. This map gives detailed coverage of the Stourport and Droitwich Rings including the whole of the Staffordshire and Worcestershire Canal up to Great Haywood Junction where it joins the Trent and Mersey Canal, with emphasis on the waterways and information useful and relevant to users of the waterways without neglecting other leisure users. The map detail is complimented by information panels and photographs. The Stourport Ring, slightly more triangular than circular, with a city on each apex. Starting from Aldersley Junction in Wolverhampton the route heads down the Birmingham Canal Navigations into Birmingham, before turning south and travelling the entire length of the Worcester and Birmingham Canal to Worcester. At Worcester it turns north and heads up the River Severn to Stourport-upon-Severn. It then returns to Aldersley Junction along the Staffordshire and Worcerstershire Canal, the entire length of which is shown on this map, up to Great Haywood Junction where it joins the Trent and Mersey Canal. Whilst the Droitwich Ring is made up of the Droitwich Barge and Droitwich Junction Canals, the River Severn between Hawford and Diglis on the outskirts of Worcester, and the bottom section of the Worcester and Birmingham between Diglis and Hanbury Junction. This tourist map is at 1:50000 with detailed town plans of Wolverhampton, Tipton, Droitwich Spa, Worcester, Stourport-on-Severn, Kidderminster and Penkridge at 1:12500. An additional plan of the heart of Birmingham at 1:10000 is also included. 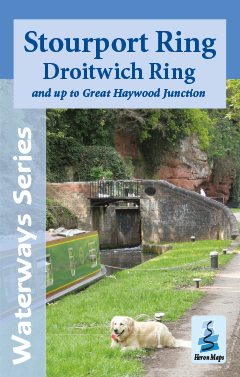 The Stourport and Droitwich Rings map is available to buy online or by telephone from our business partner, Guidepost. Click on the logo below to visit their store.